Since my whole family loves to cook, I like keeping the things we use every day out in the open. No more frantically searching drawers and cabinets for a spatula in the middle of a pancake making marathon. 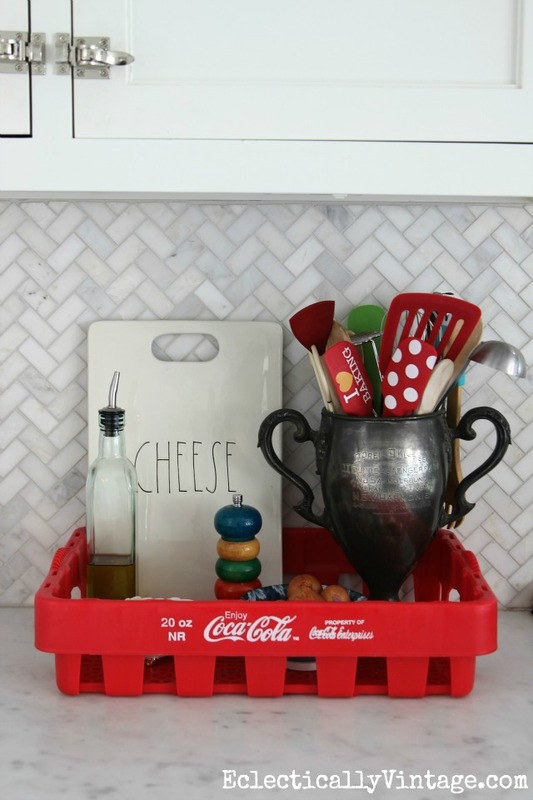 Grab your favorite tray and put those every day items on display in unique containers. 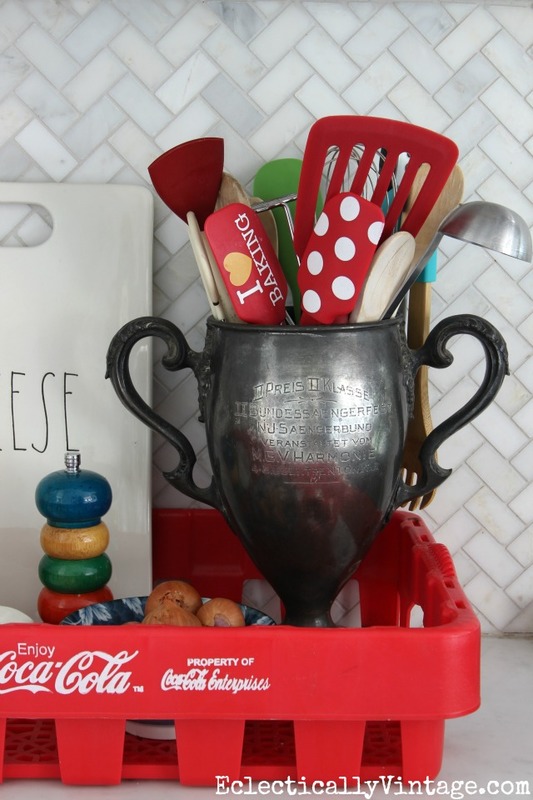 My vintage loving cup takes the prize for best kitchen utensil holder. 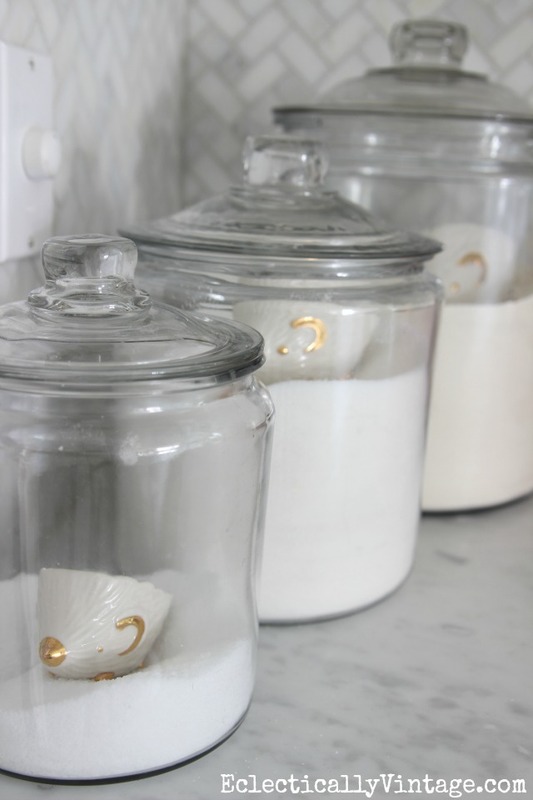 I love storing flour, sugar and salt right on the counter in these glass jars. Hedgehog measuring cups make baking much more fun. I found mine at Anthro awhile ago but they have lots of other fun choices. 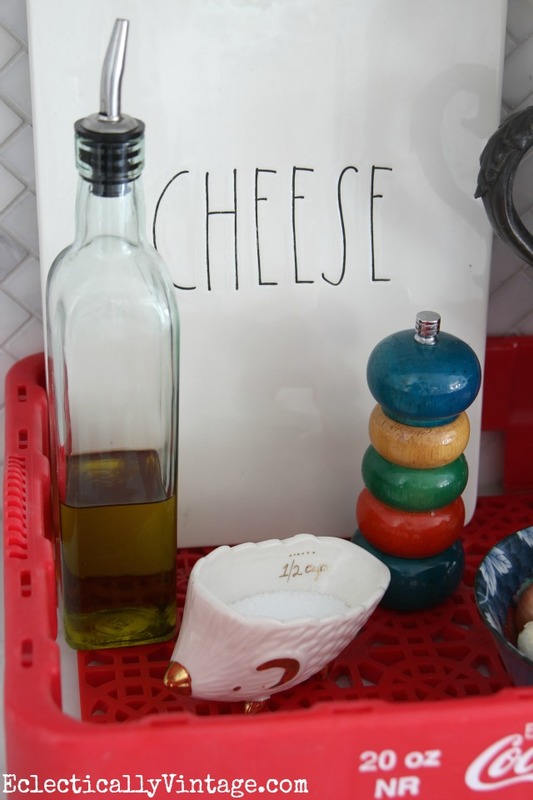 The extra hedgehog makes a cute salt cellar and a cutting board is always at the ready. I’m suddenly in the mood to bake. Or at least taste test some cookies my girls whip up. Just click on the individual pics below to see more. 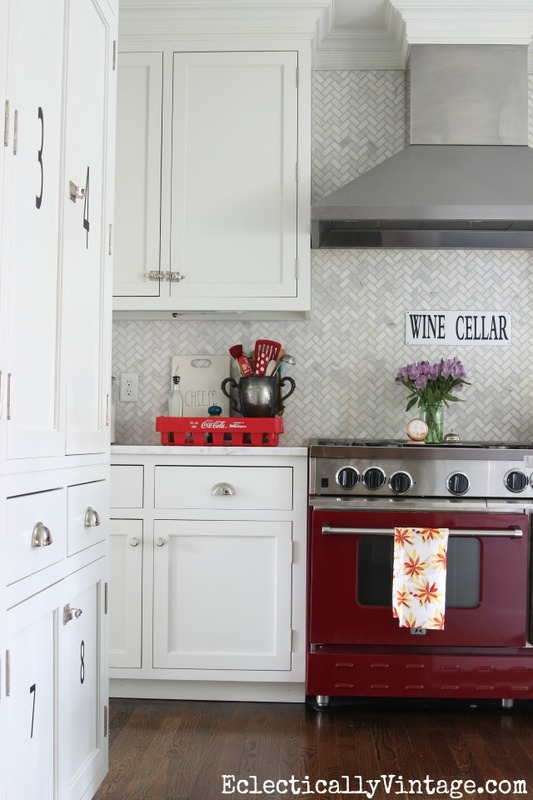 Love your kitchen Kelly, that tile is fantastic!! Love all your cute storage ideas!! There is that love cup from Trenton; love the love cup. Is the inscription in German? Do you know what prize it was for? Did you find it while you were at Rider? I have a cup from 1920 that was presented to my husbands grandfather when he was working in Brazil for Standard Oil. Not sure if was for soccer or polo, regardless I treasure it. Hi Renee – yes it looks like German to me but I’m not sure what it’s for. I got it from a friends sale – I think she found it at an estate sale. I have a collection of loving cups – love them all but this one is the largest. How nice to have a family heirloom – enjoy it! SO many beautiful vintage pieces!!! And your kitchen is absolutely stunning!!! I love how you have it cute yet super functional realistically. Very cute ideas. I keep my baking and cooking items out, too, as I think that’s what a kitchen is about! I wanted to say I love your backsplash. I’ve been looking forever—so hard to make a choice!! I love your latches on the upper cupboards! Your blog has really inspired my thrifting forays. Such cute functionality to all your treasures. I need a bigger basement though! More coming in than going out! Love this idea Kelly! Your kitchen is so pretty! 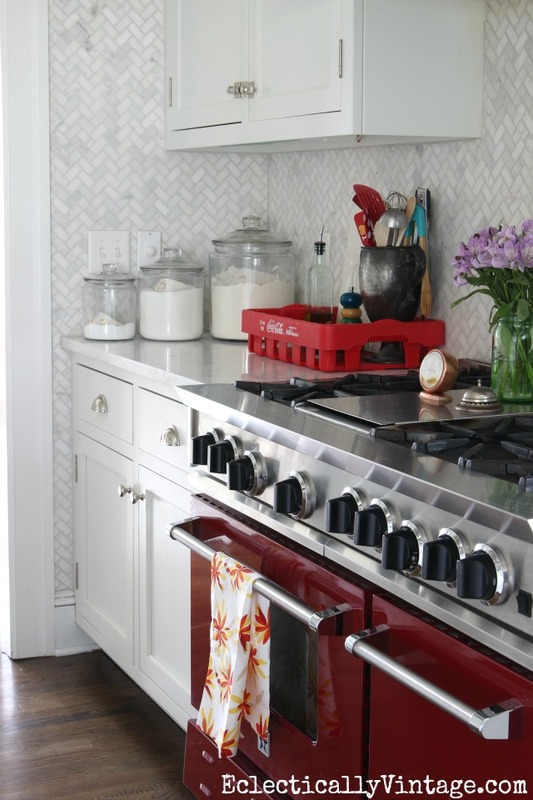 Love you kitchen and the fact that your entire family loves to cook!……Love seeing that beautiful kitchen of yours with that amazing red stove!!! How fun to have something of your grandmothers Dawn! I think you should take that mixer out and whip up a cake with gooey frosting and dig into it!